1888; There was an explosive eruption in the central crater and lava flows. 1904; There was an explosive eruption in the central crater. 1909; On 9 November there was an explosive eruption in the central crater. 1927; There may be an eruption in the central crater. 1944; In August – October there was an increase in activity. 1947; In January there was a gas eruption. 1948; On 29 April there was an explosive eruption in the central crater. 1949; On February 4 and June 12 there was an explosive eruption in the central crater. 1950; The increase in activity since March resumed in June and the following month. 1954; Explosive eruption (ash and rock) dated February 26th. April 3 thick smoke and ash rain. On April 4 and 19 there was an eruption of smoke and rock around the peak, a thick white smoke of strong gas pressure. 1973; Activities increased from November. 1974; Since January – February there has been a scorching area around the peak. The second and third weeks of April there is an increase in activity that is roar from the crater and eruption of smoke as high as 800 m.
1975; On 21 and 31 March there was a smoke eruption as high as 1000 m, there was ash rain and there were damaged areas. 1982-1984; The eruption period began on 11 October 1982 to 13 April 1984. The height of ash eruption was between 200 – 1000 m above the peak. 1986; On May 28 there was an ash eruption with an ash spread area reaching 19.25 km2. The thickness of ash is 0.5 – 3 mm. Around the peak there was a fire. On July 18 and 26 eruptions erupted with an eruption height of 800 m. November 10 and 24 eruption erupted with a height of 1000 m eruption. 1987; On 2 October there was an ash eruption, the width of the ash spread reached 15.4 km2, the thickness of ash from 0.5 to 2 mm in Nisakarang Village, Horinara, Tabobali, Lamalouk. Flares of incandescent objects up to the western and northern mountain slopes. 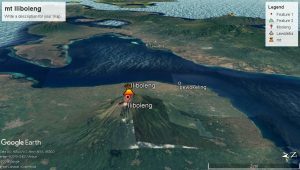 The eruption character of Mount Iliboleng is a preatomagmatic explosive eruption (manifested by a number of deposits of pyroclastic fall). Gradually, the eruption of Mount Iliboleng weakens and tends to produce an effusive eruption (manifested by a number of andesite-andesitic basaltic lava juxtaposes). primary products in the vicinity of Mount Iliboleng consist of volcanic rocks of Mount Lambanga located on the north and northeast of Mount Iliboleng, composed by precipitated pyroclastic and lava deposits that have generally experienced strong weathering; and volcanic rocks of Mount Ili Saluri located on the west and northwest of Mount Iliboleng with composite rocks dominated by pyroclastic falling deposits. The Iliboleng Mountain product is dominated by lava sediment, which consists of 27 lava units scattered around Iliboleng Mountain, and 5 units of pyroclastic falling deposits where 2 units of old pyroclastic fall are scattered to the foot of Iliboleng Mountain to the west and north, 2 units of pyroclastic fall are on the southeastern slope and south of Mount Iliboleng, and 1 unit spread around the top of Mount Iliboleng. Ili Balile Mountain Product consists of 1 rock unit that is the pyroclastic fall deposits that form 2 pieces of hill (Ili Kaliwolo and Ili Balile) located on the southeast slope of Mount Iliboleng. Secondary product consists of 2 units of lava sediment located at the foot of Mount Iliboleng east-northeast and around Wai Sword (west-southwest). Lahar Wai This sword was formed in 1975.